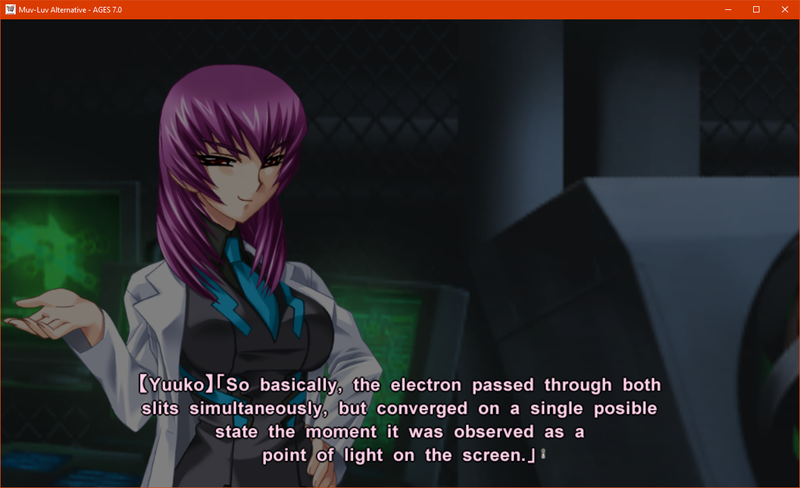 Muv-Luv Alternative BETA bug reports and feedback thread - Command Post - The Muv-Luv Community Forum! 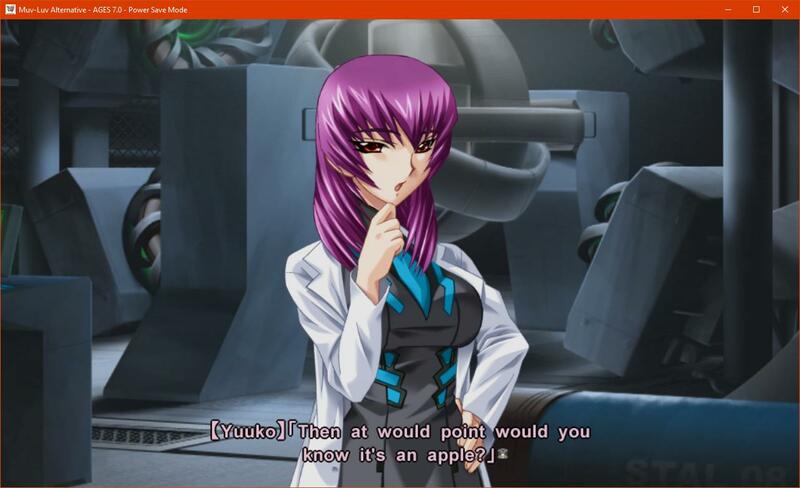 All bug reports and feedback for Muv-Luv Alternative BETA release goes here. and try to search existing issues using the search bar on the top-right to avoid duplicates/reposts. I am not a backer, so I haven't played the game personally, but I've heard complaints that the original English dialogue was removed from the visual novel release at the last minute due to a unilateral move by ixtl, something that's been confirmed by one of your translators as shown in my attached image. This is tantamount to a broken campaign promise, as both the original and redubbed dialogue were promised in the final release. I am making this feedback post on behalf of all the backers you have let down thanks to your decision. I have also started the hashtag #LetEnglishEatShit in order to draw attention to this matter on Twitter, so that this issue can be resolved by the time of the public Steam release, which I intend to play. Current date is August 23, 2017. Update: I restarted the game 4 times and the problem went away on its own. I'm unsure what caused it o_O it kept happening the first few tries. Update 2: The problem happens when I leave Steam's window open in the background. If I either close or minimize Steam's window, the Full Screen function works properly. The problem returns if I open the Steam window again. Hi, thanks for the release! Just a few comments regarding things early on. I initially set the "image language" to English, but when I looked in the options after returning to the title, closing the game out, and reopening it, it was set to Japanese. It looks like the options screen is missing the promised option to restore the original "English" audio, will this be added later? Can we have an option to change which OP video plays when the game opens? I prefer the original OP over the newer one, and for me it's just not MLA if I can't blast JAM Project every time I open the game. -Should have had an option to keep the Engrish. -Should have played the original OP with Asu e no Houkou upon startup only. I'll not complete the game until the 18+ patch is done (I know you said It might be never be made and I can think only on one scene needing it). This is because is a long game and losing the saves would be a pain. Installed on 23/08/2017 without issues, my only problem was with the OP. I love both, but one playing after the other was odd. One thing could be to play one or the other at random and put both on extras after the game is finished. I usually play in maximized windowed mode. The game presented no issued with that. Is one of the things I like about the game engine, that it scales. I have a really big screen, and sometimes I like to put the game only in a half, while I check some other stuff. The bug that some people mentions about the Windows taskbar still showing in full screen, I've seen that (and the workaround works) on Windows 10. I'll test later because I always have the latest Insider Preview of the OS. Now another thing. In a 4k display the mouse pointer is really small. Personally Is not a big issue but it might be confusing for some people. Yeah, I was super disappointed when that other OP ran initially, but thankfully you just click once and get the real OP, at least the first time. The original OP should really be the thing that greets you at startup every time, though- it's not MLA without it. And count me in too for wanting the original Engrish dialogue for the few scenes that had it- certainly the "proper" English VO that you made for this version should be the default, but give the people who played the original version (fan translated or otherwise) what they want! Bug: missing words and translation in the Advanced Settings menu. Under Performance and Power Savings Options, it seems some words were left off. Under Autosave Options, there are untranslated lines, there are no Chinese or English versions of it. Here, I guess you tried to write this in spanish... vamanos is wrong in episode 5 and the tilde is the wrong one in episode 5. The text reads "Then at would point would you know it's an apple." Shouldn't it be, "Then at what point would you know it's an apple."? 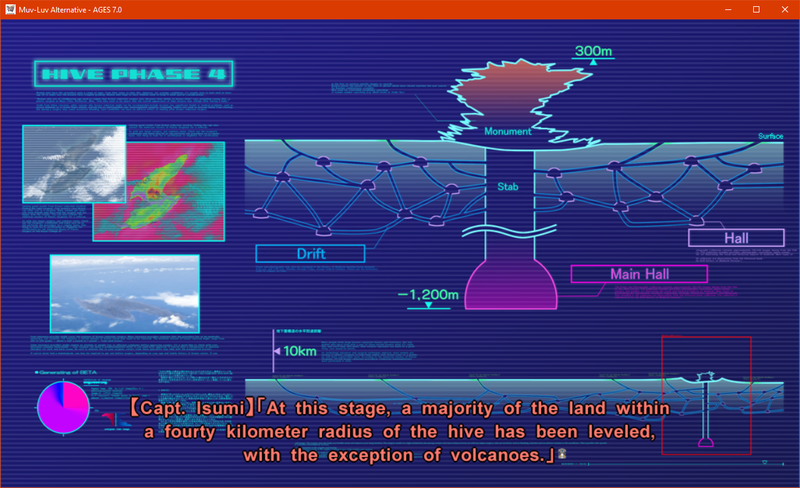 The word "possible" is missing an S in the dialogue with Yuuko. Really like the beta so far! The quality of translation shows as everything reads and flows better (leading to faster reading). Bug with controls: even when set to only skip seen, the game still skips unseen text if I press and hold the enter button too long (which isn't even that long, like more than 0.25 seconds). First playthrough. Request: Can we be able to rebind the advance key to something other than enter? The first sentence "By the by, Shirogane." should probably be "By the way, Shirogane." Edit: It seems that Meiya uses this as well on the 12/10 (Mon). After looking into the phrase, "By the by" and "By the way" are suppose to mean the same thing. Though I've never encountered the use of "by the by" in my life and it seems to be used in old 17th century English or a way of formal speech. Still, in my opinion most readers probably would not have seen or encounter this way of speaking, which is why I mistook it for a typo in the first place. I live in Canada and English is my second language, so I don't know if American or British English used the phrase "by the by" more often then "by the way". The text in this screenshot seems to be two speakers. The UN Surface Pilot 11 issuing orders and Shirogane thinking to himself. The text colour of both is the same making it appear to be the same speaker (orange). The only correct spelling of the number 40 is "forty". Edit: Though I can't find it currently, I remember seeing a misspelling of Jinguuji's name as "Jinguujij", but forgot to report it. If anyone is still currently playing through Episodes 6 or 7, I would appreciate it if you could be on the lookout to confirm that. Funny enough, The story is so good I can't stop, at least will post some the things I find... LETS DO THIS, GUYS! Here, the radius is 100km (I think the voice also says 100 not 1000). Note the background Image, says 100 too. Missing space in the dialogue. Just ctrl-f the script for "thatTakeru's". 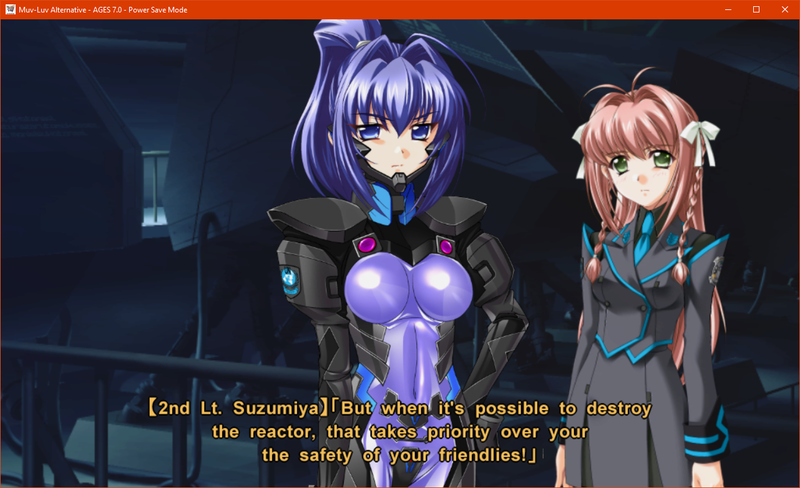 For Suzumiya's dialogue, she says, "But when it's possible to destroy the reactor, that takes priority over your the safety of your friendlies." I believe the first "your" should be removed in order for the sentence to make sense. It is not "ありせん" but correctly "ありません". It is not "沙霧直哉" but correctly "沙霧尚哉". It is not "耐えない" but correctly "堪えない". The overall experience has been good. The censored scenes where the expected ones , but the dialog still makes sense anyway (it was clear what happened). Of course I'll be more than happy to get the patch. The 3d Earth on the background was shaking. IT stopped after the fist contact with the main ship.